Corruption is India’s most secular activity. Hindu or Muslim, Christian, Sikh or Jain, rich or poor, educated or illiterate, urban or rural, all of us practice it, lap around in it, in some form or the other. Either in giving or in taking, or in watching it helplessly. Year after year, the “secular” republic slides up the totempole of sleaze, but stunningly no one is caught, no one has ever been punished. Worse, in poll after opinion poll, “We, the People” seem to indicate as if corruption does not matter in our mind’s eye. Corruption is no better in China. But as “Our Man in China” T.J.S. George writes in the fifth of his six-part series, there seem to be two key differences. One, the administration sends strong signals when it wants to, when it suits it. And two, despite the corruption, China has something to show for it. But does corruption not matter if it gets the work done? Everyone knows there’s corruption in China. It’s serious and often widespread. The motivation is money rather than power. Modern China confirms yet again that when market economy rushes in through the door, corruption slips in through the window. But, unlike India, China metes out punishment to several highprofile bribe-takers. Occasionally it can be of the sensational, example-setting variety. The biggest example set in this new century was the execution last year of a top official, a food and drug controller. In return for bribes, he allowed eight drug companies to flood the market with substandard products. The international scandal about Chinese toothpaste proving harmful in foreign markets must have shamed the authorities into giving the drug controller the severest punishment. Political leaders get caught too. A court case early this year involved a former chief of the Shanghai Communist Party who was senior enough and powerful enough to be a member of the Politburo as well. He was sentenced to 18 years in jail for bribery and abuse of power. The recent earthquake in Sichuan showed that the tendency to make a fast buck is prevalent among ordinary citizens as well. Earthquake relief materials that poured in from all over the world were misappropriated on a large scale. Bottled water, instant noodles and sausages, even tents and sleeping bags, meant for distribution among the quake-hit, were found on sale in shops. Some “modernists” also used SMS to collect money in the name of quake relief and pocket it themselves. Again, the authorities were quick to take action when the people in the affected areas rose in protest against racketeers. Fines of up to 10,000 yuan (more than Rs 60,000) were imposed on shops found with stolen goods. One shop was ordered closed. A more serious aspect of corruption unearthed by the quake may prove vexatious for the Government. Many of the schools that collapsed and caused large casualties belonged to the relatively poorer segments of the population. Schools attended by the richer kids stood erect. Clearly some buildings were put up by contractors in an irresponsible manner while some others strictly adhered to building rules. This was further underlined when all 61 schools built by a Hong Kong-based charity organisation remained intact in one area when hundreds of other schools nearby completely collapsed. Again, the authorities immediately understood that the stricter construction codes of Hong Kong made a difference to their schools while shoddy construction in other cases led to tragedy. Obviously there is a contractor-official collusion in many parts of China that can no longer be denied. However, it will be wrong to look at corruption in China without looking at the progress of China. Appropriately enough, it was an Indian who brought this to my attention. A professional banker who has been living in Hong Kong for more than 40 years put it succinctly when he said that corruption had not prevented China from notching up some of the greatest economic achievements of modern times. From the biggest airport in Asia (Pudong) to the longest sea bridge in the world (36 kilometres), from the most daring architectural wonders to an astonishing system of crisscrossing flyovers—the way urban China has developed must be some kind of a historical record. “If a country can achieve so much in so short a time, I won’t crib about corruption,” my banker friend said. Also read: Why has corruption become such a small issue? Is corruption in India really coming down? This entry was posted in Issues and Ideas and tagged China, Churumuri, Corruption, India, T.J.S. George, Transparency International. Bookmark the permalink. The banker friend is absolutely right, its not corruption that matters so much, but the absence of development and the corruption towards poor that matters. I do not care and nor do the rich if they have to pay a little extra to get their things through and if the government makes some money off their “misery”. One should at least be ethical and seek out the right changes even if he/she should be corrupt. After using it, this person A stands in the bus stop approaching anybody who wants the pass at a discount. He sells it to person B for Rs. 10. Govt. loses Rs. 30/ per guy, per day. This is one of the smallest instances of everyday corruption which ensures that the govt. loses lakhs in revenue. And when buses provide poor service, we are the first to blame the govt. My question is: When we are such God-fearing people, how come we have no qualms in indulging in such blatant corruption day in and day out? We are becoming increasingly corrupt because as a society we honour/respect/fear/sycophant rich,powerfull & corrupt. Today order of the day is Make money d’nt worry how you do it. I bet everyone would love to have friendship with there area corporator/contractor/chamacha to MLA than a lecturer/bank clerk/etc. The moral fabric of the country is in shreds. So what is the solution? a)The threat of strict punishment? b) A mega advertising/marketing campaign, urging people to opt for a conscientious living? Religious institutions, Mutts, Madrasas, Churches and Gurus in India are power centres, highly corrupt and political. To turn to these religious institutes and gurus is like learning chastity from whores. Maybe a non denominational religiousness might be the answer. But again there is no religion withpout propoganda and organizations. So we are caught in the vicious circle. I think as a soceity we need to strenghten laws of civil liberty. We need to work within the confines of a just system. Thats why the west is not corrupt. 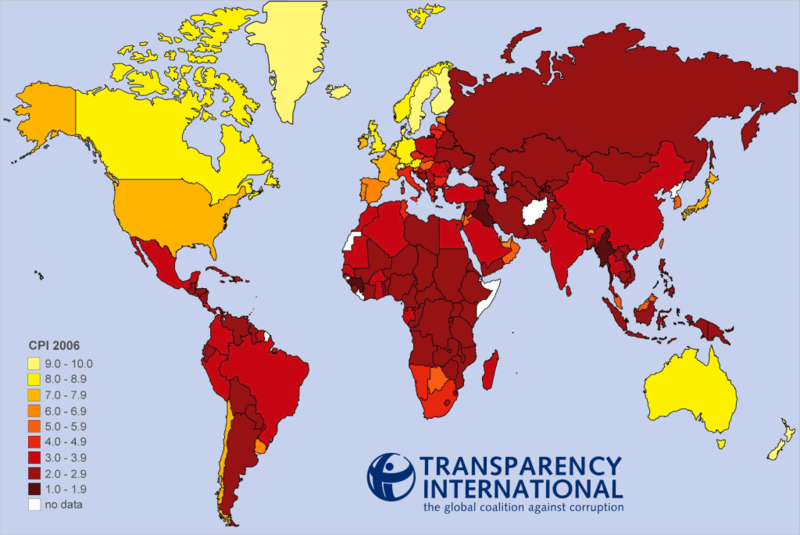 Atleast corruption is absent in those countries in the lower levels which affect the common man. Nobody ever said that bankers were the worst hit by corruption. The worst hit by corruption are those in that village whose school doesn’t have a building because the money went into the chain of middlemen. Or the everyday undertrial whose judge who will not grant bail without a bit of palm-grease.. Corruption is always a less of a problem if you can afford it. 2. People who demand money to do an extra bit than what falls under their responsiblities. The question here is that what kind of corruption do we fall under? The second category here is harmless. But where as the first one will directly affect the country, society and the people. As far as the question which is posted here “will corruption end if we hang the corrupt?” is concerned, I would say NO because as long as people who encourage corruption just for their profit exists there is nobody or nothing that can stop it..!! The fact here to be noted is that, if the rich in the country encourage corruption cos they can afford it, it is then when people demand money from the poor to do their duties and responsiblties which any government or private organization pays them to do, though the poor can not afford. Are we gonna encourage it? is the question which has to be answered by all of us to ourselves. We all to blame for the corruption. We need all facilities, subsidies. We dont provide government the feed back that they need. One or two may do so, such feed back may not reach the higher ups in the authority or even if it reaches the may not bother to heed any attention to the “commoner” voice. There should be a way where people should have access to administrators or politicians on a regular basis. govt.is formed by people for people in india.so why blame govt. only. comman man is also involved in corruption with govt.it is lack of inerest by comman man to fight agaist corruption which provides strenth to corruption in democracy. I say that its not the government to blame, we first have to blame the people. i find people , becoming corrupt due to many reasons one of them is poverty. other reasons are desire for more money. you ask a corrupt “why he is back of money”..the answer would be like this” why should not i earn a lot when my colleague is doing so”. it happens, we created corruption and now we even find the gas delivery boy asking extra money just for bring the gas cylinder upstairs….